Corio and Geelong will contest the final of the Diversity Cup on Sunday 22 February after Geelong survived a tense battle with North Geelong’s Youth team for the final spot. Corio and Geelong both have ten points, while North finished on eight. Geelong still have a game to play. Geelong eventually won three-two against a plucky North team which came within a few minutes of drawing the game. Early on Geelong dominated and had several chances to score. Nathan Munoz got the ball past North keeper Joel Gawne but then squeezed his shot across the empty goal. Jasmin Ikanovic swiveled on the ball and fired just wide. But eventually striker Vedran Stojanovic sprinted through beating two defenders and the keeper for the opening goal for Geelong after 20 minutes. North’s Seb Hessman got through on goal only to be denied by Geelong keeper Sam Versace in the 33rd minute, but a couple of minutes later Milan Sekulic equalised from a cross on the right. Geelong restored its advantage after Stojanovic hit the cross bar with a thundering shot and Ikanovic headed home the rebound. It appeared that would be the decisive goal, but in the gathering gloom North mounted a series of sweeping attacks. One of them seemed to have been repelled but the ball broke to Antonio Mikulic who struck an even harder volley and though Versace got his hands to it the ball went into the net off the underside of the crossbar. 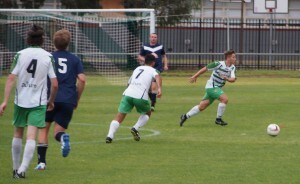 Another goal and North’s youth would be in the final, but in a breakaway Stojanovic pulled off one of the goals at the death which was his signature contribution at Corio last season. Geelong depend heavily on his speed and skill and will be a force in the coming league season as a result. In the early game, Lara fielded an understrength team as its top players had taken part and won an FFA Cup match yesterday. The lads who took the field were no match for a rampant Corio team who banged in ten goals without reply. 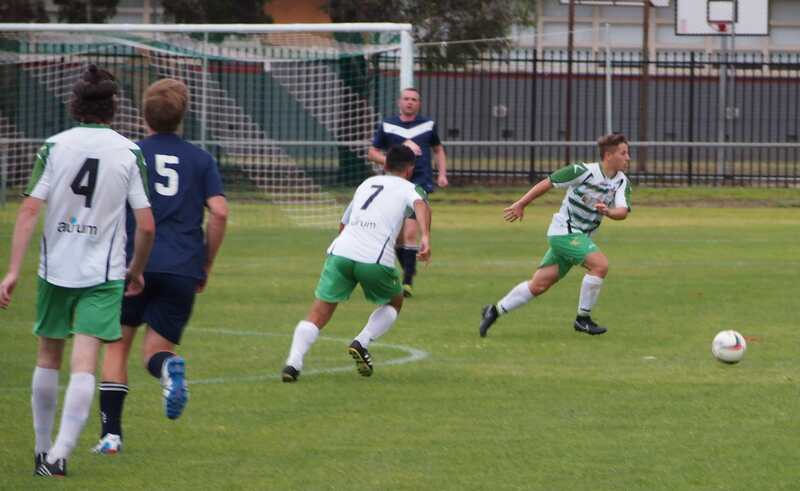 Corio’s scorers were Jordan Swaney with a hat-trick, Nathan Cook and Liam Nelson who got two apiece and Jordan Nelson, Kristian Edwards and Steve Luczo. Rhett Joy in goal for Lara made a couple of blunders but saved a penalty kick and was helpless for most of the goals conceded. These matches were originally scheduled for Friday night, and the first one actually began before a thunderstorm broke over Hume Reserve and both games were called off. So the matches due to be played on Sunday night will now take place next Friday. 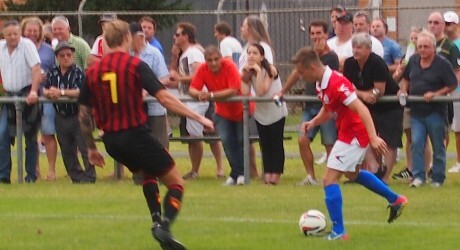 Bell Park will play Geelong Rangers at 6 pm, followed by Lara against Geelong. Bell Park currently in last place with a single point could even make the play-off for third place with a win over Rangers, but the dark blues will be favoured to get at least a draw which would ensure its place. All that assumes that Lara will not pull off the upset of the tournament and beat Geelong.